Teaching Online Journalism – Page 3 – Notes from the classroom and observations about professional practices for sharing the news on digital platforms. Each week, I post links to three (and only three) recent articles that are informative about, or pointing the way to, the future in journalism. Previous posts can be found here. There is also a Tumblr for this series, named Smarter. 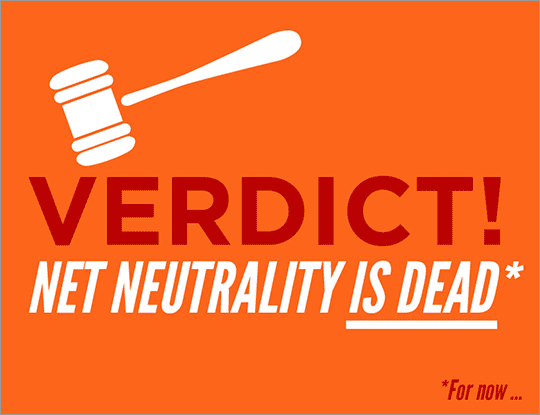 The Net Neutrality Court Case Decoded. I fear that most students know far too little about this. A Jan. 14 decision by the D.C. Circuit Court of Appeals means U.S. broadband service providers — the companies that you pay for your Internet access — are not limited by certain FCC rules that essentially require(d) those companies to offer equal access to all sites and all types of online content. This article plainly lays out the issues and explains why they matter. Takeaways: What could change about the Internet if “Net neutrality” is, in fact, dead? Look at what might happen to video streaming. Price structures for Internet service could change. The most serious concern, however, is about free speech itself. If you’ve learned about the gatekeeper role of journalism, you probably understand that on the open Internet, there are no gatekeepers. The gates are wide open, and you can get anything. The new ruling changes this, allowing U.S. broadband service providers to become powerful gatekeepers. Is This Thing On? Actually focused on viral content, this well-written article meanders enjoyably around ideas about audio stories, why we love them, why reporters make them, and why they so rarely go viral. There’s a great case concerning a Vimeo hit video titled “The Scared is Scared.” There’s the uber-case of viral audio — “Two Little Girls Explain the Worst Haircut Ever” — in which MetaFilter played a role. 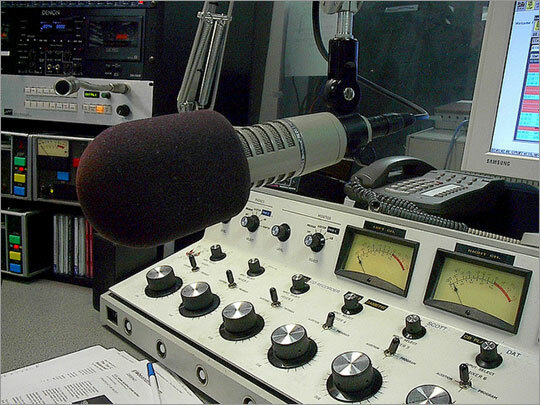 There are also some interesting thoughts about podcasting, which hardly anyone talks about anymore. Takeaways: Lots of questions here. What do we mean when we talk about “viral”? How much of it is luck? How much is having a great story that people want to share? And how much of it is the medium? Why is video more viral than audio? Pay attention to what the article says about SoundCloud at the end. That might be the key to the next viral audio event. I’d love to know what you think. Are these three items new to you? Did they make you think? Did you learn something? Tell me via Twitter or Facebook or here, in the comments. Each Sunday, I post links to three (and only three) recent articles that are informative about, or pointing the way to, the future in journalism. (Oops — this week, it’s Monday.) Previous posts can be found here. There is also a Tumblr for this series, named Smarter. Takeaways: You won’t get a blueprint for how to become a journalist from this story, but you will get some strong hints: “people can surprise you in the most unexpected ways”; “life-changing moments are within reach .” You might say this essay is not so much about the future in journalism, but for me it is about the courage and good luck that make a start for many young journalists. The Intrinsic Value of Blogging. In this short blog post, Matthew Mullenweg (a founding developer of WordPress) writes about the frustrations of knowing who is reading what you’ve written. Or rather, we don’t know. We have loads of statistics about how many people viewed a page and what they clicked and where they came from, but we don’t know who these people are — not really. Takeaways: Writing “just for yourself” is not sufficient. Writing for a faceless mass audience will not push you to do your best — and neither will writing for massive pageviews and retweets. Decide whom you’re writing for, in addition to yourself. This is a tool that can help you improve. You don’t tip competitors on Twitter; you beat them. 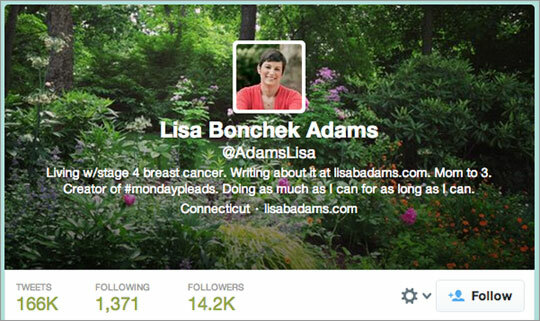 Lots of journalists use Twitter for sharing links — especially links to their own published stories. Well, that’s just one of the many ways a really savvy reporter can use Twitter. Steve Buttry, a top editor for Digital First Media, talks about letting go of fear — fear that you are tipping your competition when you are first to tweet. Get over it! You’re there, they’re not, and the way to let everyone know that is to tweet. Takeaways: Being first does not mean being careless. Accuracy still rules. However, being incomplete is not the same as being wrong. People who follow you on Twitter are not necessarily people who buy your newspaper or watch your newscast — and that’s fine. “Scooping the competition” has a new face nowadays. In case you missed them, here are links to the posts on this blog that were viewed most often in the past year, according to the stats provided by WordPress. Only three on the list are from 2013 (I published only 27 posts this year). The oldest are from 2008 (also three posts), demonstrating the value of the long tail. If you like these posts, please share the links with others. 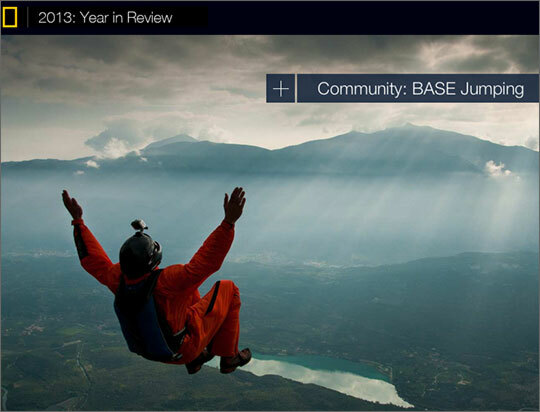 National Geographic: Year in Review. Get on your big screen for this lush, photo-filled extravaganza. Each of 12 categories (Adventure, Animals, Cultures, Space, and more) offers 10 or more glimpses into amazement (brain-eating amoebas! Kyrgyz nomads! nano flowers! Eurasian otters! cougars! 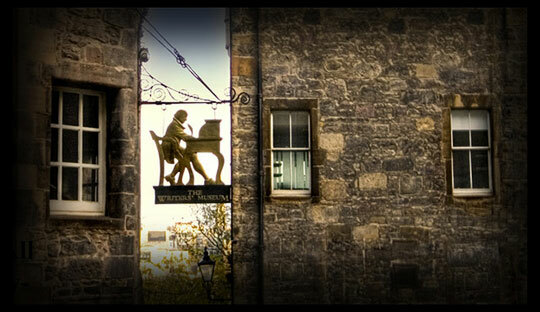 ), and most link out to a full-text story from NatGeo’s famous magazine. Just browsing provides plenty of satisfaction, but it’s nice to know that when your curiosity is truly piqued, you’re one click away from deeper details. Takeaways: Having perfected this full-screen interface in the brilliant Serengeti Lion multimedia epic, NatGeo applied it to a year-end roundup that features its own best stories. There are two lessons here: (1) Re-use and repurpose code and design when appropriate; and (2) Do not let your past stories, photos, etc., go to waste, forgotten and unviewed. NatGeo plays to its strengths here, showcasing stories and images that other publications do not have. Tomorrow’s metric for news is action. Measuring things is important, especially when those things are growing or shrinking and we’re not sure why. Newspapers, magazines, and TV networks always liked to measure (or count) subscribers or viewers. 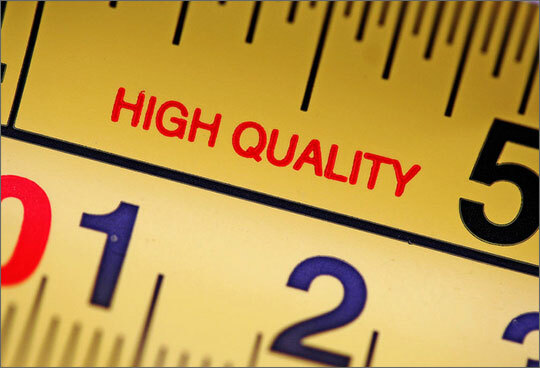 Online, however, that measurement breaks apart into individual stories or segments, and journalists look to the numbers as indicators of what they should produce more of. But wait — does that mean more stupid viral videos? NPR reporter Elise Hu says no — in this article for Nieman Journalism Lab, she suggests we should really be measuring how our journalism influences real outcomes in the world. In other words: Measure the difference your journalism makes. Takeaways: Students should make themselves familiar with the terms Hu uses in this article, such as “social lift,” “impact,” “engagement,” “time reading” (also called “time spent”). Follow her links to learn about the engagement strategies of ProPublica and Medium, two journalism organizations you definitely should be following. If you don’t know exactly what she means by “agency,” “participation,” and “community,” then get busy. Hu is writing about journalism that has value, and that’s journalism that knows what its purpose is. How do you measure that? 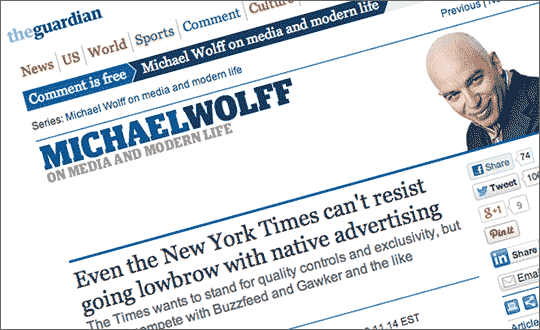 Even the New York Times can’t resist going lowbrow with native advertising. Writers now inhabit “a flattened world … in which there is only one real measure, traffic,” says Guardian columnist Michael Wolff. He means traffic to stories, which means audience, and sharing, and how many people view (and presumably also read, although that’s up for debate). Native advertising (also known as branded content) “can sometimes blur the distinction between advertising and editorial, especially in the digital space” (Joe Pompeo, writing at Capital), and that’s something most journalists know to be both dangerous and distasteful. For the esteemed New York Times to stoop so low(brow) is, well, a giant flashing confirmation that the business of journalism has changed. The question remains whether the ethics and values of journalism can survive this. Each Sunday, I post links to three (and only three) recent articles that are informative about, or pointing the way to, the future in journalism. Previous posts can be found here. There is also a Tumblr for this series, named Smarter. 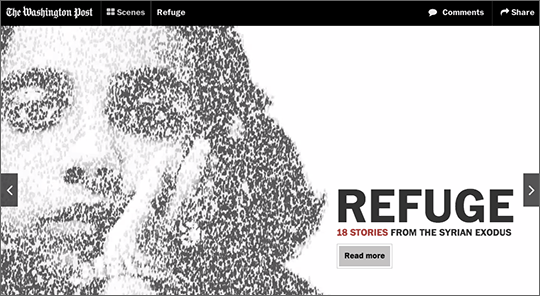 Refuge: 18 stories from the Syrian exodus. Many Americans are unaware of what is going on in Syria. The civil war there started almost three years ago. This collection shows — with photographs, videos, text and maps — what happens after Syrians have fled from the fighting. This is “one of the largest forced migrations of people since World War II” — more than 2 million people. Takeaways: We can scan through these stories in a random, casual way, and stop whenever something catches our attention. It might be a photo. It might be a pullout quote. This is not a traditionally structured “long form” journalism narrative. How does that affect our understanding of the Syrian situation? Does this manner of storytelling have a stronger chance of getting attention in a media-saturated world? Scooped by code. 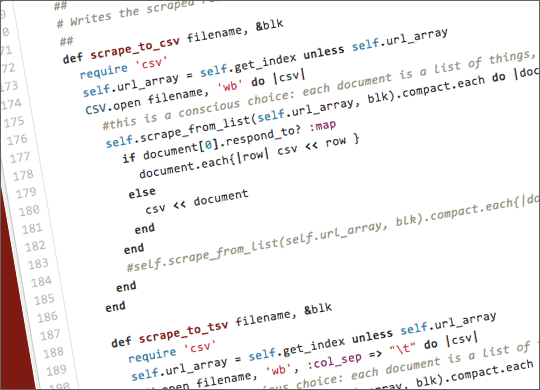 There’s been plenty of discussion among journalists lately about learning to code. Here, Scott Klein of ProPublica (a nonprofit investigative journalism organization) explains how journalists use their code skills to uncover stories that no one else has found. Takeaways: “Scraping websites, cleaning data, and querying Excel-breaking data sets are enormously useful ways to get great stories.” If you don’t know what “scraping” means, get busy with Google. If you think code is only used for making apps, check out the three story examples Klein links to in his essay. If you want to be the journalist who gets stories that others don’t, learn how learning code can help you. 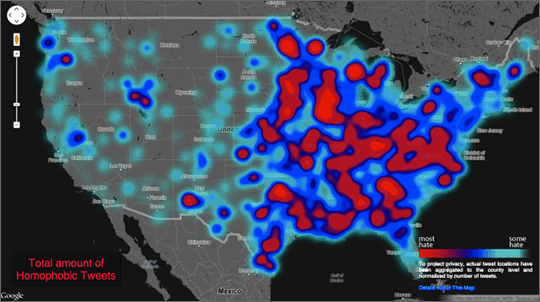 Data and visualization year in review, 2013. Do you like seeing cool charts that explain things clearly? This roundup of examples and links highlights a wide range of information graphics that help us understand things better. Some of them come from journalists, and some come from scientists and statisticians. This was published on the excellent blog Flowing Data, by Nathan Yau. Takeaways: Maybe you’re not an artist, and maybe you lack love for statistics, but most of us comprehend numeric data more quickly when we see it represented in graphic form. Notice how many of these examples use a map. Have you played with Google Maps Engine? How much do you know about making accurate charts and graphics to communicate about money, people, and amounts of things? Did you ever use Excel to make a chart (say, in high school)? If data visualization is a good tool for explaining, then more journalists should be able to do it. Planet Money Makes a T-shirt. This is one of the most effective uses of multimedia storytelling I’ve seen. It started with a cool question: How do T-shirts (ubiquitous and usually taken for granted) get made? 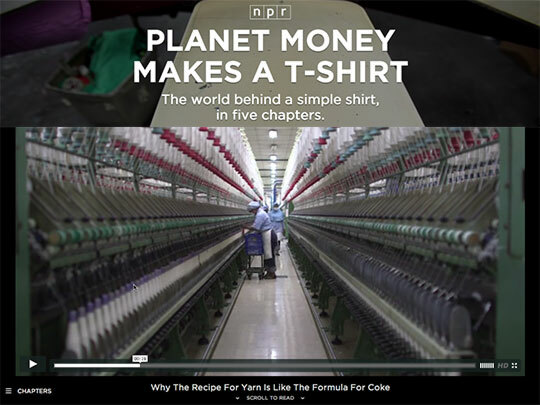 In April 2013, the Planet Money team of journalists launched a Kickstarter campaign to fund a reporting project about the global garment industry. People could pledge $25 to get a T-shirt, and Planet Money would report every step of that T-shirt’s production, starting in the cotton fields of Mississippi. Backers put up $590,807. Ten reporters covered the story, some of them traveling to Indonesia, Bangladesh, and Colombia along with the cotton as it became cloth and, finally, 25,000 T-shirts. Takeaways: Tight integration of video, text, and information graphics makes this a seamless (pun!) story from the reader/viewer’s perspective. You can choose among five chapters, but you never have to click and leave the main story. It’s easy to follow. Ruthless editing kept each part of the story short and snappy. The videos take us to places we’ve never seen before in a whirlwind tour — no time to feel bored. Charts are clean and clear. The text is straightforward and engaging. This is a great example of how to make a story interesting and use all media types to their very best advantage. 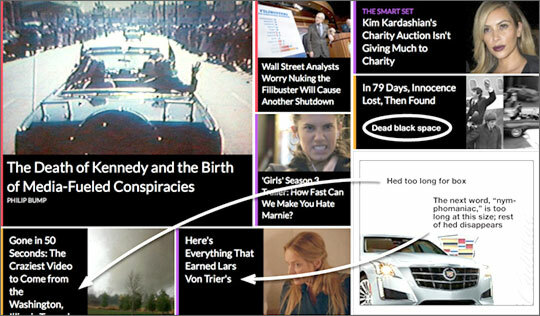 Why Are Upworthy Headlines Suddenly Everywhere? Don’t let the headline fool you — this article from The Atlantic is not all about Upworthy OR headlines! It’s actually about how Facebook and Twitter drive traffic to news sites, which in turn drives editors to try anything they can think of to get people to click what they post on Facebook and Twitter. The power of these sites was illustrated in October when Facebook changed the algorithm that controls its News Feed, and traffic to news sites from Facebook increased even more. Takeaways: It used to be that people bought a newspaper or tuned in to their favorite nightly news show on TV. That’s not how most people get news today. The phrase “drives traffic” obscures a larger truth: Facebook is responsible for what a lot of people find out about what’s happening in the world. This affects how they think about issues and maybe even how they vote. 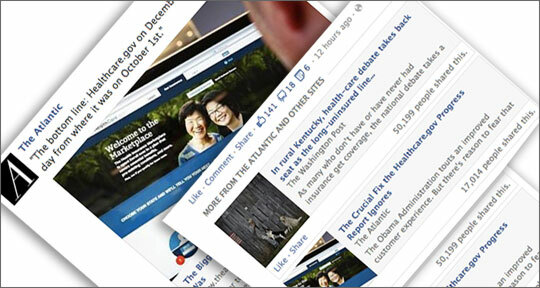 Find out how Facebook determines what appears in your News Feed. Takeaways: Mobile design advocates, including Miranda Mulligan and Damon Kiesow (quoted in the article), mostly dismiss Kirkland’s concerns. Mobile viewing of news sites is the present and the future, and the number of people who browse a big, crowded “home page” or “landing page” is expected to continue its decline. Therefore, resources invested in those large-screen formats are (largely) wasted. Each Sunday, I post links to three (and only three) articles that are informative about, or pointing the way to, the future in journalism. Previous posts can be found here. There is also a Tumblr for this series, named Smarter. Medium’s metric that matters: Total Time Reading. Are you reading Medium? It’s a longer-form writing and social platform developed by Ev Williams, co-founder of Twitter, and it just recently opened its doors to all writers. This article discusses why a common metric used to (supposedly) show how popular articles or sites are — pageviews — is NOT the metric Medium considers most important. It also discusses engagement, a pretty hot topic in journalism circles right now. Takeaways: Understand engagement and attention and how they contribute to success or failure of a content operation (a publication, a website). If you spend your time writing or editing a great story, don’t you want people to spend time reading or watching it? The questions listed at the bottom of this post are worth thinking about. Design, testing and launching new products at BuzzFeed. 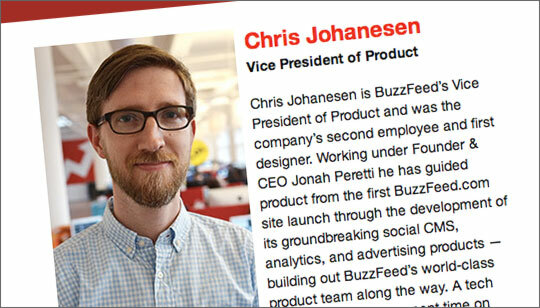 In this interview with Chris Johanesen, we learn about the design team and product managers at BuzzFeed, and how what they do contributes to the popularity of the site and the brand. The site’s mix of serious news and cute baby animals is a strategy, not an accident. Since Ben Smith became editor-in-chief in January 2012, BuzzFeed has added “verticals” focused on politics, tech, and entertainment. Takeaways: In a digital world, UX (user experience) is an important part of attracting people to a website or an app. BuzzFeed tracks all content and lets editors know, “in realtime, how their posts are performing.” The team also focuses on how fast pages load on both desktop and mobile platforms. Note the emphasis on scrolling rather than clicking. Making a successful information product (whether it’s journalism or entertainment or both) requires more than just a bunch of content. Free Expression, Surveillance, and the Fight Against Impunity. “When someone acts with impunity, it means that their actions have no consequences. Intimidation, threats, attacks and murders go unpunished” (source). 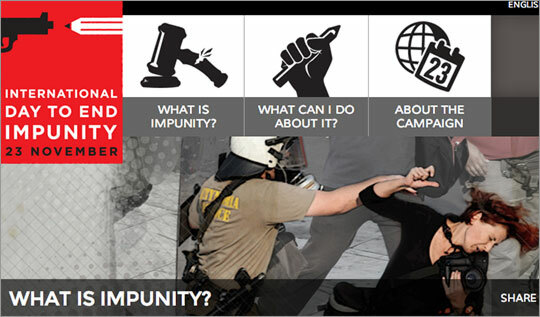 Nov. 23 was International Day to End Impunity, and although the day has passed, this short blog post on the Deeplinks blog (from the Electronic Frontier Foundation) can still open your eyes to how threats to journalism are really threats to everyone’s safety and freedom, and to human rights in general. You can explore different kinds of challenges to free expression in this interactive feature: Break the Silence. Takeaways: Physical threats are not the only kind of danger that journalists face. Systematic efforts to put journalists under surveillance are “crimes against privacy [that] can be used to intimidate or limit the work of free speech.” Also, it’s not only journalists who are standing up. Activists, artists, and everyday citizens around the world also put their personal safety on the line.